14.23mm x 16.73mm / 0.56in. x 0.659in. 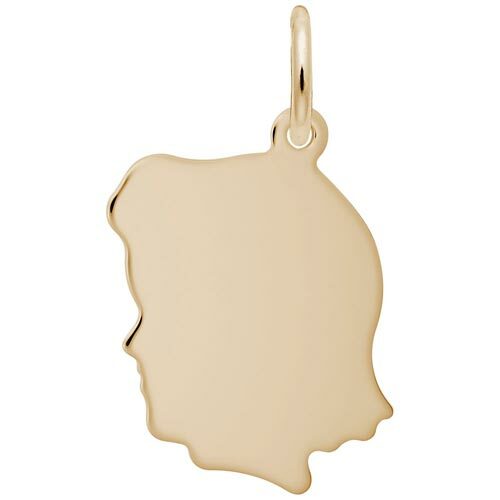 Flat Medium Girl's Head Charm by Rembrandt Charms. The height is 5/8 of an inch. The Flat Medium Girl's Head Charm is a perfect way to represent your daughter or granddaughter on a charm bracelet. Engrave her name and birthdate. The silhouette jewelry piece can be placed on a necklace as a pendant or will be a wonderful addition as a charm for a Charm Bracelet. All Rembrandt Charms are available in either silver or gold.